Alternate-current cable manufacturer NKT said the new combined cable company would be a leading on- and offshore high-voltage cable supplier. It allows NKT to enter the direct-current high-voltage cable sector, the Danish firm said. ABB said the high-voltage business was part of its power grids division, which is currently undergoing a strategic review. NKT will acquire ABB's business for an enterprise value of €712 million, but ABB has also committed to building a new €124 million cable-laying vessel, which is due to be delivered in Q1 2017, resulting in a total transaction value of €836 million. In order to help pay for the transaction, NKT's board of directors has announced its intention to raise new equity, up to 9.9% of the company's share capital, and has cancelled a share buy-back programme. 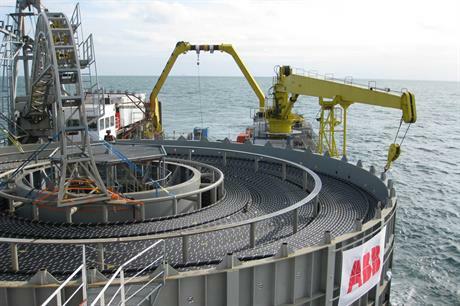 According to NKT, ABB's high-voltage cable business had an order backlog of €1.1 billion. "We are combining two strong cable portfolios rooted in a shared Nordic heritage that will be more competitive on a larger scale under NKT Cables' ownership, while maintaining access to supply through a long-term strategic partnership," said ABB CEO Ulrich Spiesshofer. "ABB's high-voltage cable business will add considerable strength to our portfolio and bring us a world-class manufacturing operation. We will leverage the technology, domain competence and highly skilled workforce to grow this business," said NKT Cables CEO Michael Hedegaard Lyng. Due to the acquisition, NKT will separate its cable business from its cleaning equipment firm, the Danish company said. "Both businesses will be viable, stand alone companies and, when the acquisition is closed, it is the board of directors' intention to split NKT Holding into two separately listed companies," NKT said.